SYSTEM REQUIREMENTS: Please click here for System/AutoCAD requirements. All technical support through , as well as Forum and FAQ (always being updated), are FREE to anyone interested. Easy to use interface, makes compiling batch scripts intuitive. (At first glance, Hurricane looks complicated with many buttons on the main interface, but these all have a reason. To save you time! PLEASE Take the time to explore the interface, and become familliar with it. Unlike other batching programs, Hurricane doesn't congest your system with unnecessary files, and databases which can become corrupted over time. All Hurricane data files are saved in plain text (ASCII) format so you can edit them using ANY software. Unlike many other batching programs, all drawings run in one AutoCAD session rather than "open-run-close, open-run-close..." which wastes a lot of time. Drawing file Preview - Save time finding your files, the drawing preview can always be active, and floats, so any drawing you click on is automatically previewed in this window. No need opening a file selector to be able to preview. Command Capture Tool - Record your AutoCAD commands with Hurricane's built-in "Command Capture Tool" - This feature can save you hours of time trying to create your scripts. Just perform your task in AutoCAD once, and copy your AutoCAD command buffer (F2) to Hurricanes Command Capture Utility, it will parse through the commands and create a script for you. "TAGS" - Save you time, by allowing you to include Dynamic Data in your batch script without having to edit your scripts every day. Project TAGS - Save your custom TAG Associations based on your "Project", and use the same scripts to replace data across multiple projects without modifying your scripts. Simply associate your group of ProjectTAG tags to a directory, and Hurricane will substitute your data accordingly. META Commands - Save you time by allowing you complete control of the Hurricane interface from WITHIN your scripts. Setup Hurricanes GUI using MetaCommands and never have to figure out what the settings "should-be" for a particular script. Drag and Drop files and Folders from Windows® Explorer to Hurricane (video here), any files matching the filter will be added to the file queue. Drag and Drop Folders to the Hurricane file selector to easily switch Hurricane to that directory. "UserSets" allow the user to have different working screens for Hurricane, and switch over in an instant. This is useful for people who work on several projects at a time. Search for AutoCAD DWG's by AutoCAD Version - This feature saves you time by hunting down files on any drive based on the version of AutoCAD file you specify. Quickly search your network drive for OLD AutoCAD files and quickly isolate them for conversion to your current version. Report Drawing Version (in queue) to file - Quickly create a report showing what AutoCAD version all your files are saved in. SCRIPT WIZARDS - Help you to create scripts quickly and easily. Title-Block Update Wizard to easily update title-block information in your drawings using attributes. Search and Replace Text Wizard to easily generate batch scripts to search and replace text in all your drawings. PageSetup Wizard to easily insert PageSetups from other drawings. Report Limits to file Wizard to easily generate a text file which contains all of all your drawings limits. Search for TEXT and Log Wizard to easily flag drawings that contain a particular string of text. Purge Wizard to easily generate batch purge scripts. Quick Launcher - Use Hurricane to launch AutoCAD drawings (or any other registered filetypes). Just double-click on the DWG file in Hurricane and AutoCAD will start with that file. The "filter" can be used to limit the list of files. Stop being annoyed by the windows file selector and explorer, use Hurricane to open that file FAST. Easily select files and add entire sub-directories structures with a single-click, across networks or local drives (or both). Lisp routines can be added and loaded with an easy run fully automated (command-line based). This gives the user the freedom and flexibility to perform ANY commands on hundreds of drawings at a time. Since you may have your own "lisp" files that you use all the time, why not apply them in a batch Script? Script Editor floating window. When active, this window floats over AutoCAD making editing your scripts easier than ever! Script Syntax Checker can be automatically applied each time you attempt to create a batch script. The checker will test a variety of common script syntax mistakes that can lead to wasted time creating scripts from scratch. When batch plotting, the QSAVE can be disabled to speed up the plot/load process. This allows you to run in "test run" mode, which allows you to confirm your script functions properly before applying changes to your drawings. Save/Recall File-Lists, which can be modified, and appended to others to create monster file-lists. You can drag and drop file-lists that were generated from other applications. Easily remove duplicate entries in the file queue (which may appear when combining multiple file-lists). Copy filenames to clipboard in a variety of formats. This allows you to save time creating "transmittal documents". Favorites Folders List - Always saves your working directories (the ones you generate a script to run on) in a HotList. If you find yourself changing your working path often, Hurricane saves you time by remembering them for you automatically. When exiting HURRICANE©, all settings are saved such as last used directory, screen position, last command line accessed etc. Never waste a minute trying to get the interface sized the way you left it, or hunt for the last directory. This saves lots of time when going back to a project over and over again. Display files based on a live "filter". Just start typing in the "Filter" box, and the list of files updates automatically. Use this feature to "weed-out" only those drawings that you want to edit. A counter for assessing how many files you have processed. Useful for assessing how much time you have saved. (You can also use "Hurricane Watch" (a FREE companion program to Hurricane) to show you exactly how many drawings and when they were run. All DWG files are modified by YOUR AutoCAD installation, NOT an external program. 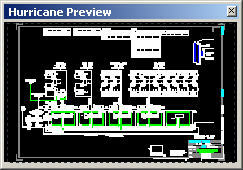 Hurricane does not take control, or interfere with your setup of AutoCAD, like some other programs do. It runs completely independently and your AutoCAD setup remains unaltered. When patches/updates are available, it is easy to upgrade (for free), through simply overwriting the existing EXE file with a new one. "Your #1 CAD time-saving tool!" Windows® XP/Vista/Windows 7 and VB are registered Trademarks of Microsoft Corp.
for as long as you like!